For the second time in two weeks, authorities searched the City Hall office of Alderman Ed Burke, and NBC 5's Carol Marin has all the late breaking details. This time there was no brown paper covering the entrance to the third floor finance committee office at Chicago’s City Hall, but federal agents returned to the office of Alderman Ed Burke on Thursday, sources tell NBC 5. According to two sources, six to eight federal agents arrived at the alderman’s City Hall office at approximately 4:30 p.m. Thursday afternoon with a search and seizure warrant. 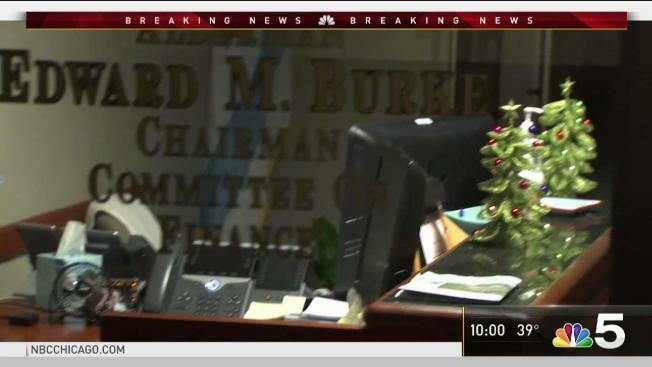 Just two weeks ago on Nov. 29, agents executed search warrants on both Burke’s 14th Ward office and his finance committee suite. Like the previous search, there is still no official word on what agents were looking for when they searched the offices. On the night of the original raid, Burke downplayed the significance of the search, saying that he would cooperate with federal authorities. He did not speak to media on Thursday after news of the latest search became public. Since that initial search, some progressive aldermen have sought to trim Burke’s power, including his oversight of the city’s $100 million worker’s compensation program.